Sam Raimi's prequel to the WIZARD OF OZ is a movie in which I can see so much to admire but which bored me for all of its overlong two hour ten minute runtime. I loved the visual design of the black and white prologue in a turn of the century Kansas carnival, where our anti-hero conman, conjurer and lothario, Oz, escapes an angry husband by taking off in a hot air balloon that will whisk him to a land of his subconscious that he has narcissistically called Oz. I love the riot of CGI colour and subversive naughtiness by which Oz immediately romances the credulous witch Theodora (Mila Kunis), before breaking her heart and turning her to the Dark Side. I love the costume design that sees Rachel Weisz wicked with Evanora in luscious dark green ballgowns and Michelle Williams' good witch Glenda in gorgeous shimmering white. I love the casting of James Franco - who has always been almost too handsome, and painfully wooden and uncomfortable with that beauty. His too wide smile and slightly hammy acting perfectly suits the conman role. Most of all, I love the idea that despite all his petty cunning, Oz is really an idealist, who is full of admiration for Edison's inventions, and wonder at the power of cinema. In fact, OZ can be read as a movie about how cinema saves lives, much like ARGO. The problem is that the movie just takes too long to motor through its various machinations to finally get Oz into his confrontation with the newly wicked Evanora and Theodora. It also seems too adult for kids and too kiddie for adults - in sharp contrast to Pixar who seem to be able to entertain both groups simultaneously. How much of the target kiddie audience really get why Evanora turned wicked, and why Oz' final victory is rather ambiguous? And how many adults were squirming with boredom during the whole munchkin, quadling city scene - in fact, for much of the final 90 minutes? 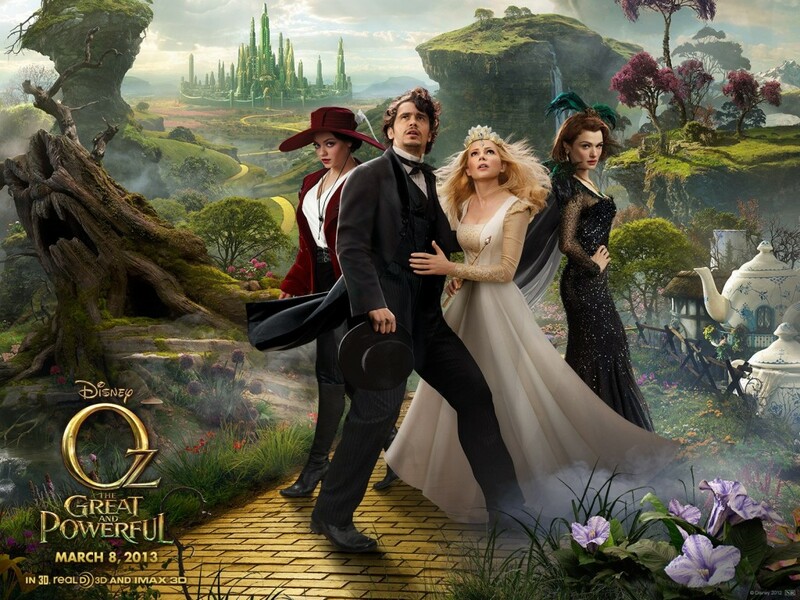 OZ THE GREAT AND POWERFUL has a running time of 130 minutes and is rated PG in the USA. The movie opens this weekend in Argentina, Australia, Chile, Croatia, the Czech Republic, Denmark, Germany, Greece, Hong Kong, Hungary, Israel, Italy, Kuwait, Malaysia, New Zealand, the Philippines, Portugal, Macedonia Russia, Serbia, Singapore, Slovenia, Thailand, the Ukraine, Brazil, Bulgaria, Canada, Iceland, India, Ireland, Japan, Lithuania, Mexico, Mongolia, the Philippines, Poland, Romania, Spain, Turkey, the UK and the USA. It opens next week in Belgium, France, the Netherlands, Estonia, Finland, Norway, Sweden and Taiwan.